In the American muscle car world, horsepower is king (see the new Shelby GT500 rumors), but in the heavy-duty truck world, bragging rights are all about torque. And in that area, Ram does not like to lose, which is why the 2019 Ram Heavy Duty makes a ridiculous 1,000 lb-ft of torque. If you don’t believe me when I say that Ram doesn’t like losing the heavy duty “torque wars,” just look at the Ram 2500 and 3500’s torque output over the last few years. In 2010, Ford debuted a 735 lb-ft diesel Power Stroke diesel engine for its Super Duty line. Then, right around that same time, Chevrolet showed of a 765 lb-ft Duramax truck, leaving the Ram—then making just 650 lb-ft—in the dust. In the summer of 2010, Ford showed off an 800 lb-ft Super Duty diesel reflash, and Ram responded not long after with its own 800 lb-ft Cummins. Then in 2013, Ram went all in with an 850 lb-ft 3500 truck. In 2015, Ford climbed to the top of the torque mountain with an 860 lb-ft Power Stroke diesel, and Ram quickly responded with a truck whose Cummins diesel made 865 lb-ft. Then Chevy went to 910 lb-ft and Ford went to 925 lb-ft in 2017, and Ram responded the next year with 930 lb-ft. That same year, Ford put out a 935 lb-ft Super Duty. The whole thing is really silly, but that’s how it all stands today, with Ford on top by five lb-ft. So of course, Ram’s dialing up its torque-o-tron, and giving the 2020 Ram Heavy Duty 1,000 lb-ft.
We’d seen a bunch of spy shots (like these from Truck Trend), so between those and the teasers, we had a good idea of what the new heavy duty truck would look like. 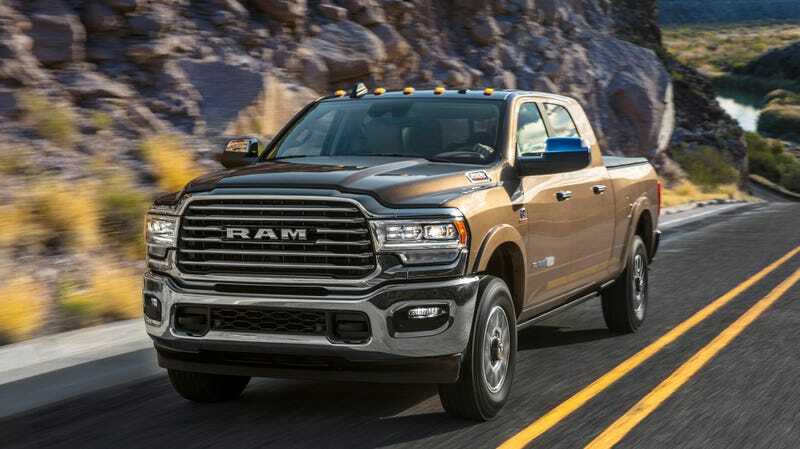 So what we have here is a vehicle whose styling has been brought more in line with that of its half-ton counterpart, the 2019 Ram 1500, and based on what I’m seeing, it looks good.